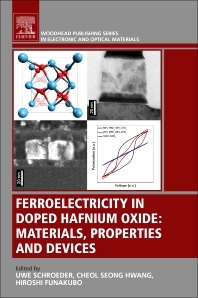 Ferroelectricity in Doped Hafnium Oxide: Materials, Properties and Devices covers all aspects relating to the structural and electrical properties of HfO2 and its implementation into semiconductor devices, including a comparison to standard ferroelectric materials. The ferroelectric and field-induced ferroelectric properties of HfO2-based films are considered promising for various applications, including non-volatile memories, negative capacitance field-effect-transistors, energy storage, harvesting, and solid-state cooling. Fundamentals of ferroelectric and piezoelectric properties, HfO2 processes, and the impact of dopants on ferroelectric properties are also extensively discussed in the book, along with phase transition, switching kinetics, epitaxial growth, thickness scaling, and more. Additional chapters consider the modeling of ferroelectric phase transformation, structural characterization, and the differences and similarities between HFO2 and standard ferroelectric materials. Finally, HfO2 based devices are summarized. Dr. Uwe Schroeder has been in a Deputy Scientific Director position at Namlab since 2009. His main research focuses include material properties of ferroelectric hafnium oxide and the integration of the material into future devices. Prior to joining NaMLab, Schroeder was in a Senior Staff Scientist position at Qimonda, which was previously known as Infineon Technologies Memory Division and prior as Siemens Semiconductor. He joined Siemens in 1997 for DRAM capacitor development in the DRAM Development Alliance with IBM and Toshiba in Hopewell Jct., NY before transferring to Infineon’s Memory Development Center in Dresden, Germany in 2000. Here, he continued the research on high k dielectrics and its integration into DRAM capacitors as a project manager. During this work the so far unknown ferroelectric properties of doped HfO2 based dielectrics were discovered. He focused on a detailed understanding of these new material properties and their integration into memory devices. He is (co-) author of more than 250 papers, conference contributions, and book chapters and 50 patents. These results include various publications on ferroelectric HfO2 material properties and based devices: 50 peer-reviewed scientific journals, 35 invited presentations and one book chapter. Cheol Seong Hwang received the M.Sc. degree in 1989 and the Ph.D. degree in 1993 in department of inorganic materials science and engineering, both from Seoul National University-Seoul, South Korea. He joined Samsung Electronics as a senior researcher in 1994 and made contributions to the fields of semiconductor memory devices including his research on high-k dielectrics such as (Ba,Sr)TiO3. Since 1998, he has been a professor with the Department of Materials science and Engineering in Seoul National University. He has authored or coauthored more than 495 papers in international peer-reviewed scientific journals, which are cited ~17,700 times, has given 95 invited presentations in international conferences. He also holds ~ 75 international/domestic patents. He is a recipient of Alexander von Humboldt fellowship award, the 7th Presidential Young Scientist Award of the Korean government, and AP Faculty Excellence Award, Air Products, USA. His current interests include high-k gate oxide, DRAM capacitors, new memory devices including RRAM/PRAM, ferroelectric materials and devices, and thin film transistors. Hiroshi Funakubo is a Professor of the Department of Innovative and Engineered Materials, Tokyo Institute of Technology. He received a Ph.D. degree from Tokyo Institute of Technology. In 1989, he was an assistant professor in the Faculty of Engineering, Tokyo Institute of Technology. In 1997 and 2012, he has been an associate professor and full professor of Tokyo Institute of Technology. He is now the Professor of the Department of Materials Science and Engineering, School of Materials and Chemical Technology, Tokyo Institute of Technology. He received the Richard M. Fulrath Award of The American Ceramic Society in 2008. He is the author of more than 600 original papers in international peer-reviewed scientific journals and has given more than 55 invited presentations in international conferences. Specific areas of interest include preparation and properties of dielectric, ferroelectric and piezoelectric films.